None of my prints have had more vital life than "Autumn Gate." Painted early in my career, and slow to find its audience, "Autumn Gate" has become one of my most enduringly popular pieces. 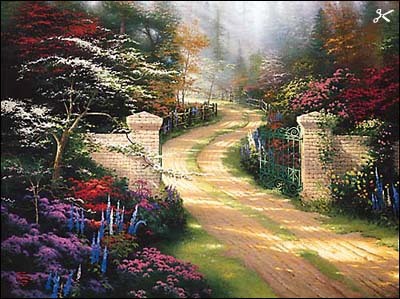 You may remember that I've imaginatively traveled through that gate to discover a splendid house and garden beyond. I'm returning to the subject, in a new season, with Spring Gate This heroically sized piece launches a new series that promises to follow our familiar path to reveal the glories of the season of rebirth. 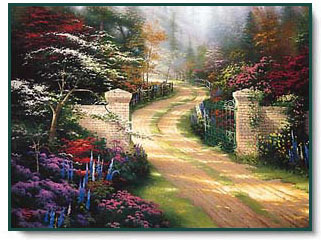 Spring Gate copyright© 1996 by Thomas Kinkade.